For what will soon be a decade, the Smart Grid has been heralded as the next revolution in the electricity sector. Whilst the electricity industry's new economic model is slow to emerge, despite the political declarations, despite "smart" meters starting to be deployed, and despite it being urgent for us to revisit the way we produce and consume electricity, for reasons of economic sustainability and social acceptability... a reality is going to become obvious : the electricity industry is going to become an industry of information. Whatever the regulatory framework, and the will to make it develop, may be, the structure of the electricity sector seems frozen. Historically, this structure is based essentially on two factors. The first is the capital intensity associated with electricity production and transmission assets. This capital intensity and the particularly high break-even point for these assets constitute significant barriers to the entry of new players onto the market and explain the viability, even the effectiveness, of economic models which in other situations are recognized as limiting competition. The second factor relates to history and national/local specificities : in all countries, the combination of the importance of the State and of the Regulator, the choices dictated by the land's lack, or, on the contrary, abundance, of primary energy sources and concerns over energy security explain significant differences in the production apparatus and, through a ricochet effect, in market structure. This situation, which is characterized by a limitation in the pace and pressure of competition, is in the process of changing, in France as elsewhere, under the impact of a third factor : information and the technologies which support it - notably through the Smart Grid and Big Data. At this stage, the only certainty that we have about the Smart Grid is that it is going to enable the creation, collection, transportation and use of a mass of information the like of which the electricity network has never experienced. The increase in volumes of available information obviously does not necessarily bring with it the ability to use these data for the overall optimization of the electrical system and/or for the improvement of the value proposals for the end consumer. Thanks to " Big Data ", which provides both the technologies and the methods for processing, analyzing and understanding large volumes of data, the technical obstacles are in the process of being removed. But it must be clearly understood that Big Data becomes effective only if the infrastructure - Smart Grid and Smart Meters - able to generate the data is deployed, which is far from being the case in the major European countries. 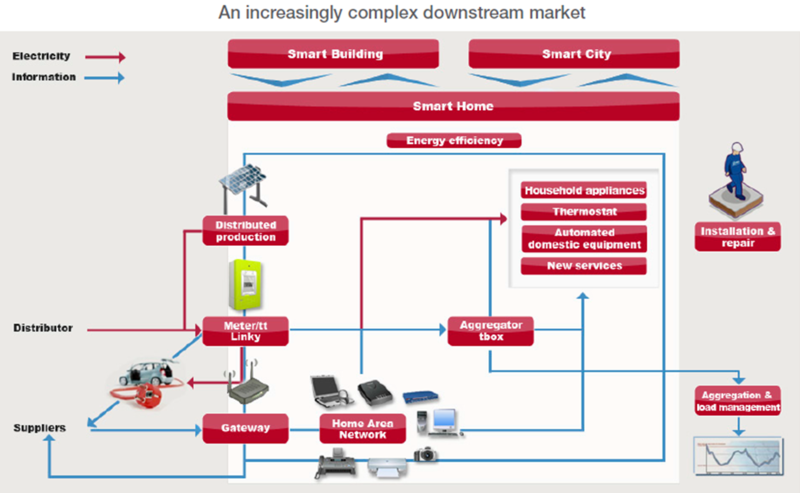 By way of illustration ; in France, the large-scale deployment of the Linky smart meters, the key component of the future " smart " network, will begin only in 2014 and will not be completed before 2020. That is certainly a reasonable time period for equipping 35 million homes and staggering an investment of a few billion euros. On the other hand, given that it is strongly predicted that the cost of electricity will continue to increase, it is a very far-off horizon for the consumer who ultimately needs to control his consumption and his electricity bill. Does this mean that until then nothing will change ? That is unlikely, above all because the price of electricity is going to increase continually, inciting more and more consumers to look for solutions for reducing their energy bill, but also because information technologies are developing fast and in a largely unpredictable manner. There's nothing to say that a game-changing innovation might not emerge tomorrow. A number of players, from the energy sector and from other sectors, are working on it and thereby looking to position themselves on the market for the use of consumption data and for services relating to the individual's controlling of his energy expenses. The emergence of service offerings around load management is just the first sign of this. Even if no one player has really established itself on this market, the possibility for the consumer to reduce his bill without loss of comfort and for the network operator to smooth out the load and to control costs by limiting the progression of investments linked to the usage peak on the network does not seem to be an unachievable objective for the market. Load management is one avenue, and others are going to emerge once the data exist and are accessible to the players who wish to use them - bearing in mind that today the consumption data belong to the end consumer who can do nothing concrete with them without going through a complementary tool or interface. For the market's major players, the mistake would be to believe that the development of product and service offerings and of the competitors present will be linear. Industrial history shows unequivocally that markets based on the use of information (telecoms, internet) grow exponentially once the production and use of information goes beyond a critical threshold. They are also characterized by the emergence of a leader - who is sometimes undetectable a few months before this growth. Finally, they are based not on co-existence with the traditional assets of the industry but on a transfer of value from physical assets to digital assets. 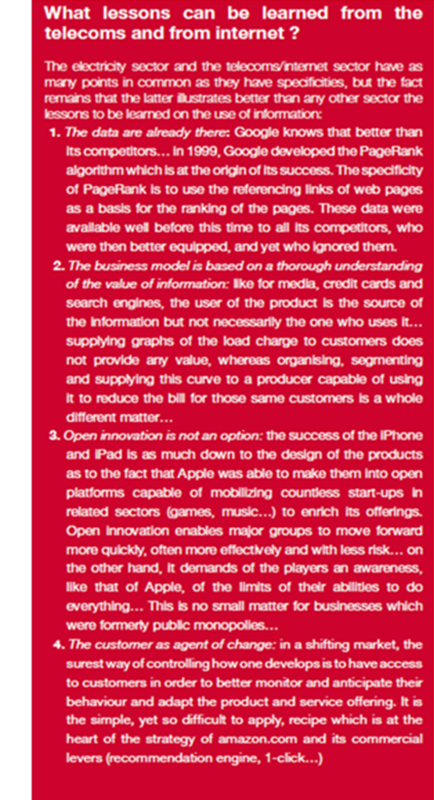 This last point, often poorly grasped by the players in place, is fundamental and even more so in business models based on networks, as illustrated in the telecoms field by the meteoric inroads made by players like Google and Apple (for the iPhone and the iPad) which capture and generate value to the detriment of the traditional operators who are relegated to the rank of infrastructure suppliers... Such a scenario cannot be excluded in the electricity sector, although a different approach needs to be taken regarding transmission and distribution, on the one hand, and production, on the other hand. In the field of the transmission and supply of electricity, the emerging scenario is analagous to those observed with telecoms and the internet. New players are seen to appear, most often at the local level, around " Smart" themes (Grid, Cities, Building, Home...) with proposals of value in the making, most often based on the use of consumption information (load curve, household appliances, ...) and the provision of associated services. This process should continue as the collective sensitivity to the energy bill increases. Beyond a certain sensitivity threshold the market converges towards the handful of players who managed to build offerings meeting the expectations of customers and capable of significantly reducing their energy expenditure. Supply remains in the hands of traditional players but faces more and more competition from new players who propose innovative services and attempt to integrate the supply offering into an overall package of offers in a transparent way. The recent purchase by Google of Nest, a Silicon Valley start-up which produces smart thermometers, could illustrate this scenario. There are obviously brakes, notably technical and regulatory ones, on this scenario becoming concrete, but the conditions for removing them are already well in place, namely : motivated entrepreneurs, promising innovations and consumers who are all the more sensitive to the issues given that they see their purchasing power dwindling. Concerning production, the changes are more uncertain. They will certainly be subsequent to, and conditioned by, those that occur to the networks and will be linked to the development of production technologies (nuclear, but also gas and renewable energy). However, upstream of these changes, it is easy to imagine the price pressure that can bear down on businesses centred on production in the environment that the preceding scenario suggests will exist ... It is this highly probable situation which the operators must anticipate. In other words, the probable changes to the downstream portion of the electricity industry and the continuation of the upward trend in the cost of energy necessarily refers them back to the question of the energy mix and to the decisions regarding investment in production facilities which they are taking today. They must notably build into their strategic thinking the logic of short circuits, bearing in mind that whilst the reterritorialization of production is a fundamental tendency, it demands of them close integration and a highly-developed mastery of the technologies of information allowing them to produce in a manner which genuinely meets real needs as closely as possible. The scenarios which we have just described have not yet materialized. Whilst nobody is capable of saying exactly in what timeframe these transformations will play out, they are already at work, drawn by the meteoric development of technologies of information which affects all economic sectors. The electricity industry, on which all other sectors fundamentally depend, must also move into a new era. The currently prevailing models are not sustainable and it is clear that the solutions concerning solely the downstream portion, as efficient as they may be, will not be sufficient to resolve the complex equation of energy security in a context of increasing rarity and thus long-term rises in primary energy costs. Although electricity has been a revolution for humanity and the electrical network the greatest technological success of the 20th century, the electrical industry must now project itself into the 21st century by reinventing itself with the ammunition of today : information and the technologies which make it usable, economical, sustainable and value-creating. 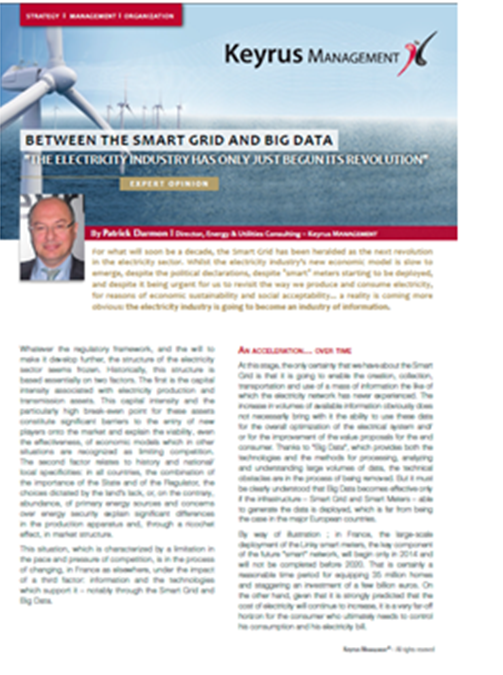 - Actively observe the Smart Grid ecosystem (industrial companies, start-ups, local authorities, ...) : active observation covers a vast field which stretches from monitoring competitors to acquiring innovative start-ups, directly or via an equity fund. Its purpose is to understand, even to anticipate, the technological and marketing developments of this ecosystem in order to better integrate it into the Smart Grids strategy. - Deploy an " all-out" client awareness strategy so as to collect and aggregate all client information (demographical, economic, behavioral, consumption, relational, ...) and be in a position to respond to changes in demand. Such a strategy is obviously based on Smart Grids technologies but also on client relations data captured through the operator's different channels (agencies, call centers, web, ...). - Put in place a culture of experimentation : in a market in which technologies and clients evolve quickly, systematically experimenting is certainly one of the best and surest approaches for making a success of innovation. In this regard, the numerous initiatives launched by demonstrators in Europe, at the European, national and local levels, allow the key questions to be tested, as much regarding the technologies as the market.